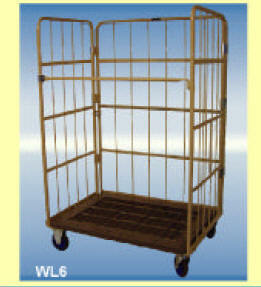 Our traditional style Supermarket Trolleys are manufactured from high quality steel wire. Market conditions have demanded designs of robust and durable construction. Our Traditional Supermarket style trolleys are fitted with high quality castors, sourced from reliable suppliers world wide. The Traditional Supermarket style trolleys have a high quality acid zinc finish achieved on a fully automatic plant. For long life protection, the process is completed with the application of an air dried water based lacquer. The surface finish of the metal is not only a function of the plating process but also of the wire quality. For this reason plating quality wire is used throughout. A fold out baby seat and swivel castors front and rear come standard with the 200 litre Traditional Supermarket trolley. The 90 litre trolley is built with to the same high standards as the trolley above, except on a smaller scale. The 90 litre traditional trolley comes standard with a baby seat and front and rear swivel castors. The Unique folding design allows the empty cage trolley to be nested reducing the storage space required in the Warehouse. 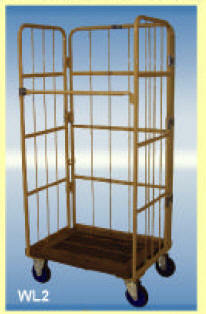 Once fully loaded, the cage style trolley offers large volume capacity with ease of movement. Available in two sizes - 300kg and 500kg capacities.